Every now and then I like to write about a cool contest going. I also like it because it’s a new an interesting way to promote your product online. 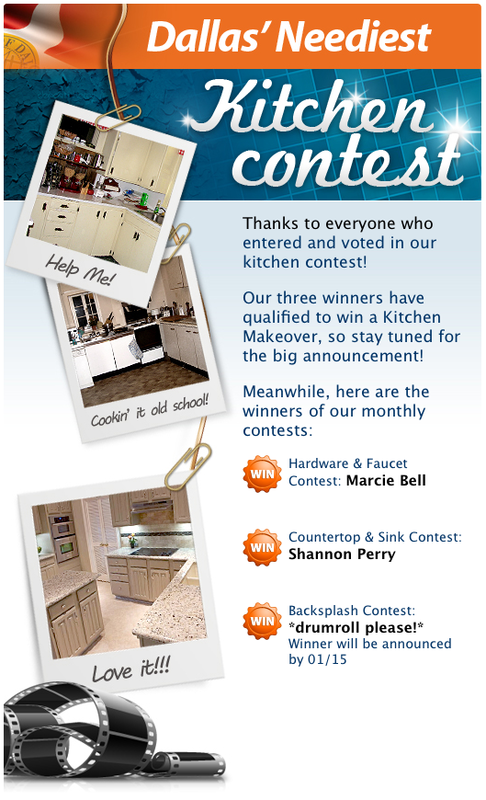 I have new appreciation for Facebook contests and some of the contests that companies run. A Local Dallas kitchen remodeling company Snappy Kitchens started a contest on Facebook looking for the Neediest Kitchen in Dallas. The winners of the contest get some pretty cool prizes. So why do I like contests so much? I like contests because they help people to engage in something that they would not have normally engaged with. But for the odd fact that a company is giving away something for free, they will do whatever it takes to win that item. Contests, coupons, and really any other incentivised offer out there is a way of getting people to do something they normally wouldn’t. You will get a few that will enter or buy that were already going to buy but they are a small majority. The science behind the deal is huge. People love to fell like they are getting a good deal. You never go into a women’s department store and not see a deal going on. Women love shopping and finding the best deal out there. It’s the same online, you typically have to offer some sort of a deal to get the majority of people online to look at or even consider your product. Putting something like; deal, coupon, offer, or sale will help you to get more traffic coming to your website. They will also open up so much more to buying your product. The science behind PPC deals is a tough one. When putting up a PPC deal you need to consider that your person is searching for the keyword that you are bidding on. Now it’s your job to convert them to a paying customer.